At each turning of the seasons, we climb Lower Table Rock in southern Oregon. 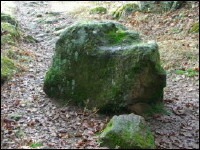 As we pass the large rock in the shape of a bear's head (Bear Rock), we pat Mister Bear on his nose and thank him for his gift of seasons. Our youngest people stand on the smaller rock so they can reach his nose. Then we walk the old trail to the ceremonial meadow where we dance bear dances to celebrate the new season. This native ritual is centuries-old. 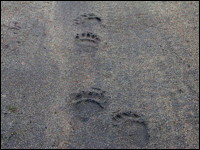 Left: Bear tracks in the Siskiyou Mountains of southern Oregon. Center: Bear Rock on Lower Table Rock. 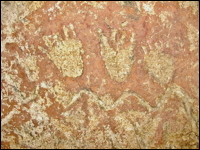 Right: Ancient carving of bear prints in a cave in Oregon.